Pontus Carlsson earns 2nd GM norm! Sweden may have another Grandmaster in the near future. Pontus Carlsson informed The Chess Drum's Daaim Shabazz that he has earned his second GM norm at the Open de Tarragona (Spain). Carlsson stated that the tournament was well-organized. The 23-year old star beat GMs Artur Kogan and Vladimir Malakhatko enroute to a 6½-2½ score… a half point above the norm. Carlsson estimates that he has gained about 20 ELO points and is nearing the 2500 plateau. "Maurice won't feel lonely much longer!" 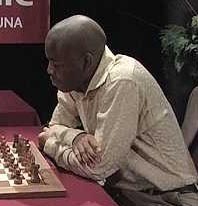 referring to GM Maurice Ashley, the first African-American Grandmaster. His next tournament will be the European Team Cup with Swedish team Sollentuna SK. Carlsson earned his first GM norm at last year's European Cup.